The National Neighborhood Indicators Partnership (NNIP) is sad to share that Tom Kingsley, founding director of NNIP, passed away on January 21, 2018. Throughout Tom's long career, he made significant contributions to the community information, housing policy and international development fields. He will be deeply missed as a colleague, mentor, and friend. Tom committed the last phase of his career to building NNIP. In 1996, he skillfully guided the launch of the network, bringing together partners from very different institutions and contexts. Under Tom's leadership, NNIP grew from 6 to more than 30 partners and became a space for its partners to debate ideas, share lessons, and lift up solutions. Tom kept the network focused on impact, often writing stories himself of how local partners were influencing their communities. He also wrote and edited two books in 2014 to capture the lessons of NNIP and broader use of community information: Strengthening Communities with Neighborhood Data and What Counts: Harnessing Data for America's Communities. On NNIP's 20th anniversary, the network created the G. Thomas Kingsley Impact Award - an annual award in Tom's honor for a partner organization that used neighborhood data to help low-income people. At the time of the dedication, a number of NNIP partner staff sent special messages to thank Tom for his commitment to NNIP (see the video here). Through NNIP's dedication to democratizing data and facilitating data use to improve communities, he has left a lasting legacy that benefits urban areas across the country. 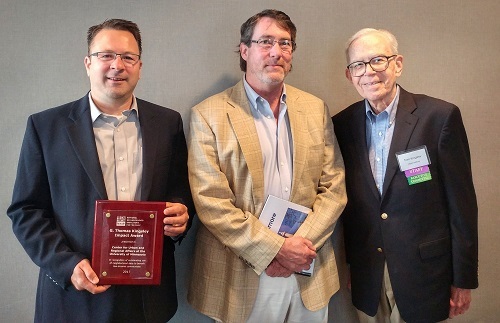 (Tom is pictured here with the winner of the inaugural awardee Jeff Matson and community partner John Vaughn from the Twin Cities). NNIP was only one aspect of Tom's multifaceted career. In June 2017, the Urban Institute honored Tom with the Urban Mastermind Award, given to a scholar who has made an outstanding and longstanding contribution to Urban. Tom joined the Urban Institute in 1986 following service in New York City government (during the Lindsay administration), in Indonesia (for the United Nations Centre for Human Settlements), in India (for the Ford Foundation), and for the Rand Corporation. He brought to Urban a deep understanding of what on-the-ground practitioners need and want from research, and has taught all of us how to design and conduct work that delivers on those demands. In his three decades at Urban, Tom helped build influential domestic and international programs. In addition to founding NNIP, he directed Urban's Public Finance and Housing Center from 1986 to 1997; codirected the Ford–funded Urban Opportunity Program, which produced four books on urban policy in America. Tom also helped launch and build Urban’s International Activities Center (now International Development and Governance), including major projects in Indonesia, India, Jamaica, and the Czech and Slovak republics that informed those countries’ efforts to restructure local government functions, promote urban economic development, and reform housing institutions. Tom was a prolific author of influential Urban Institute reports and briefs, journal articles, and book chapters, including Housing Markets and Residential Mobility (1993) and Urban Economies and National Development (1991). In recent years, Tom’s research focused on analyzing patterns of neighborhood poverty and distress. He has investigated the impacts of the foreclosure crisis, drew lessons from the US Department of Housing and Urban Development’s HOPE VI program for urban policy and the future of public housing, assessed American Indian housing needs and programs, and provided analytic support to the Annie E. Casey Foundation’s major place-focused initiatives. Most recently, he had actively returned to his past interest in international development, with an influential paper on the need for local data capacity in cities in developing countries. Tom has mentored dozens of colleagues at Urban and throughout his career. His dry humor, indefatigable good spirits in the face of adversity, talent for turning challenges into opportunities, unfailing common sense, and uncommon decency all made Tom a wonderful person to work with and learn from. His memory will inspire many to carry his example with them through their own careers, both at the Urban Institute and in institutions around the world.